Giant cell glioblastoma (GC-GBM) is a rare variant of glioblastoma characterized by the presence of predominant population of bizarre multinucleated giant cells. The clinical behavior and pathogenesis of this unique tumor is still not completely understood. We report a case of GC-GBM in a 42-year-old male with 3 months history of generalized seizures. He also complained of headache accompanied by vomiting since 1 month. The intensity of headache had increased over last 7 days. The patient had left hemiparesis and non-contrast enhanced computed tomography scan showed right temporoparietal isodense mass producing resultant mass effect. The tumor showed a rim of calcification [Figure 1]a. A right temporal trephine craniotomy with radical decompression of tumor mass was carried out. Intraoperatively, the tumor mass was grayish, soft, and moderately vascular. The patient showed good improvement after surgery and following 7 days post-surgery, he was fully conscious and oriented. Patient died after 17 months after diagnosis and he had been taking alternative medicines and did not take any chemotherapy or radiotherapy. Histopathological examination of the tumor revealed a highly cellular tumor made up of large pleomorphic cells with several mitotic figures and bizarre giant cells having nuclei of a variable number, size, and shape [Figure 1]b. Foci of calcifications were seen in the tumor parenchyma [Figure 1]c. No oligodendroglial component was identified. Many scattered microcalcifications were also seen. Palisading necrosis was focally seen along with few mitoses. On immunohistochemistry, the tumor cells were positively labeled for glial fibrillary acidic protein and Ki-67 labeling index of 30% [Figure 1]d. A diagnosis of GC-GBM with calcification was made. GC-GBM is rare tumors of central nervous system characterized by the presence of bizarre, multinucleated giant cells. They represent 0.8% of the brain tumors and 5% of all the glioblastomas, in general. These occur in the cerebral hemispheres especially in the temporal and parietal lobes. They occur in the fourth decade of life with a slight male preponderance. Histopathologically this tumor is composed of malignant glial tissue admixed with pleomorphic, bizarre giant cells. Microscopically it needs to be distinguished from pleomorphic xanthoastrocytoma. Both these tumors are composed of giant cells and may show cellular xanthomatization. However, the presence of numerous bizarre giant cells and atypical mitosis favors a diagnosis of GC-GBM. Calcification when seen in brain tumors are usually indicative of better prognosis and it is rare and unusual in high grade astrocytomas and glioblastomas. Histological features suggesting a better prognosis in glioblastomas include the presence of multinucleate giant cells, oligodendroglial differentiation, younger age, and frequent lymphocytic tumor infiltration. Calcifications in glioblastoma have been reported in the past., There is also a published report  of a GC-GBM in an 8-year-old patient with neurofibromatosis-1. The morphology of this tumor showed massive lipidization and calcification and the patient had a longer survival time than other glioblastomas. To conclude, our case demonstrated foci of calcification along with the histopathologic features of GC-GBM. Calcification could also possibly be another parameter indicative of longer survival as this patient survived without any aggressive treatment for 17 months. De Prada I, Cordobés F, Azorín D, Contra T, Colmenero I, Glez-Mediero I. Pediatric giant cell glioblastoma: A case report and review of the literature. Childs Nerv Syst 2006;22:285-9. Martin F Jr, Lemmen LJ. Calcification in intracranial neoplasms. Am J Pathol 1952;28:1107-31. Palma L, Celli P, Maleci A, Di Lorenzo N, Cantore G. Malignant monstrocellular brain tumours. A study of 42 surgically treated cases. Acta Neurochir (Wien) 1989;97:17-25. Kubota T, Kogure Y, Yamamoto S, Matsubara S, Kitano T, Hayashi M. Calcification in glioblastoma multiforme of the cervical spinal cord. Surg Neurol 1986;26:183-6. 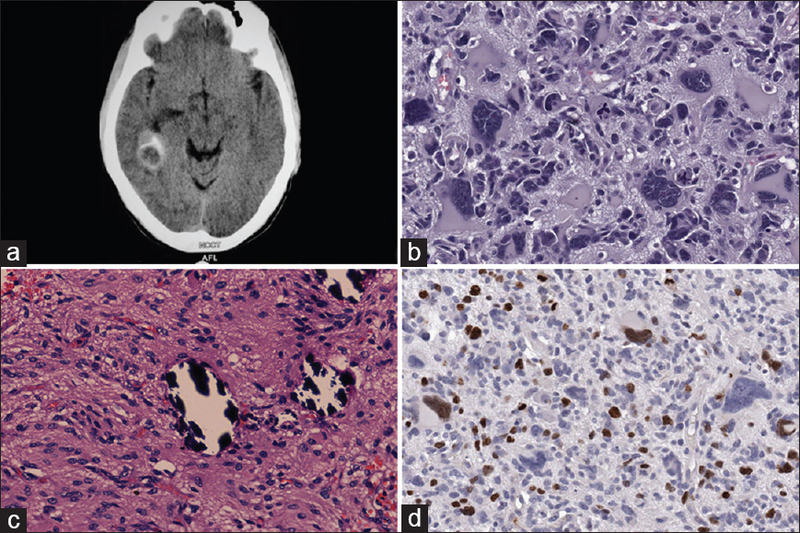 Kroh H, Matyja E, Marchel A, Bojarski P. Heavily lipidized, calcified giant cell glioblastoma in an 8-year-old patient, associated with neurofibromatosis type 1 (NF1): Report of a case with long-term survival. Clin Neuropathol 2004;23:286-91.